you need when you need it! In two minutes, see how using the best portable walls on the market can add new life to your school. Choose your specific height, length, and color! 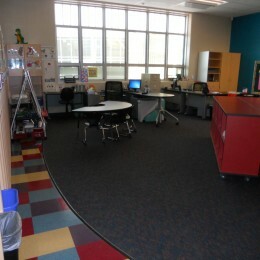 Collaborative school furniture can be used in a traditional classroom, offices, open spaces, makerspace, libraries, and computer labs. That is one of the most appealing advantages of using portable room dividers over fixed walls and furniture, is that you can make your school more functional and flexible in its space usage. By arranging a room divider wall in your school, you can create private study areas, dynamic art displays, create quieter learning environments or maximize classroom space. An added benefit to our school partitions and wall panels is that they provide the perfect amount of sound absorption for deadening and dampening sound in the classroom, library, auditorium, cafeteria, gymnasium, and hallway. Choose between attractive vinyl or fabric-covered portable classroom dividers to match your room’s decor or to accent any space with a splash of bright color! 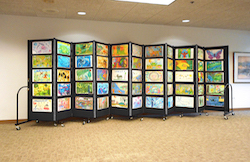 Fabric-covered school dividers accept staples, push pins, and thumbtacks for displaying school projects and artwork. Or check out some of our great options to make your dividers, even more, versatile. For instance, you could hang a whole exhibit’s worth of artwork with our optional artwork hangers. Adding our Scotchgard option will help protect our school partitions from dirt and stains, and our antimicrobial coating option helps to control germs and disease. Another appealing advantage offered by School Room Dividers is that our long-lasting Screenflex room divider products are affordable. Each school room divider is proudly made in the USA. Our team of portable partition experts strives to provide you with the best quality room divider at the best price. Our class room dividers will save you money and time. Roll your room divider out of the box, move into the desired room, and arrange in any configuration that works best for your privacy and display needs. Superior quality portable room dividers are the ONLY products we manufacture and are made of the highest caliber materials. Our freestanding, rolling separators move on self-leveling casters to keep your portable walls level and provide long-lasting durability and stability. Our industrial casters are capable of moving in a forward or backward direction as well as in a swiveling motion depending on your needs. The rubber casters manually adjust to roll over cords, debris, and uneven flooring, allowing you to place and move the temporary walls as necessary. Automatically adjustable caster wheels make rolling portable dividers extremely functional and versatile to use in various areas throughout your school. 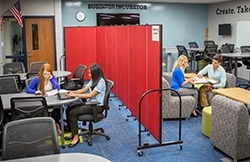 Most school customers buy folding classroom partitions for a specific area they wish to divide but then find many new uses for them once they see all the benefits their accordion-style classroom dividers partitions provide. 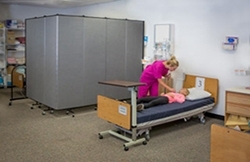 Screenflex room dividers are sound-absorbing, blocking up to 55% of the noise from one side to the other!